The ability to proxy remote repositories and cache external artifacts from them is crucial whether they are Docker images, NuGet packages, npm tar.gz files or any of the dependencies we use to create our own products. It speeds up our builds, ensures reliable access , gives control over the bill-of-materials and offers many more benefits making it a practice you cannot live without in todays CI / CD domain. This comes out of the box. No need to configure it. If an item you have downloaded and cached gets deleted from the remote Artifactory instance, your Artifactory UI will indicate it in different places you view your locally cached copy. This is something you need to know about because if you depend on this artifact, you don’t want to lose it next time you do some clean-up on your cache. 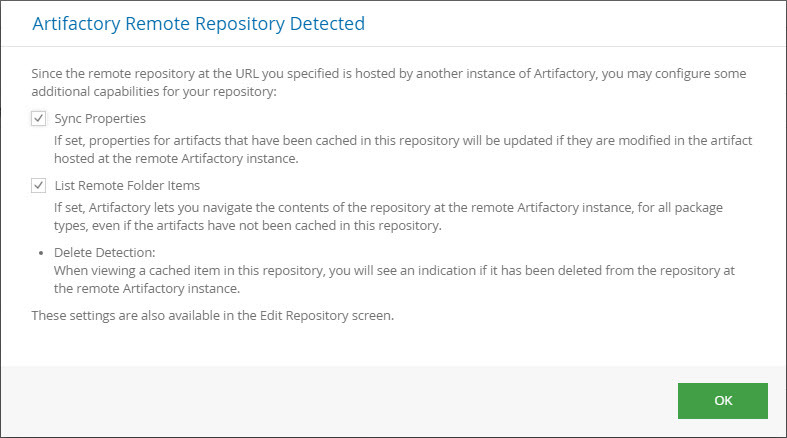 You won’t be able to download the artifact from the remote Artifactory instance any more, so you might want to move it to a local repository for safe keeping.